The arrangements feature excursions across the inner and outer dimensions of the SATB (soprano, alto, tenor, bass) range. And many come across as otherworldly, in the reaches to the very top of the soprano range and beneath the bottom of the bass range. Cortez Mitchell’s sweet, supple, penetrating tessitura graced both a Monteverdi masterpiece in the first set, ringing without vibrato solo lines that wove courageously through intersecting melodic fragments and exposed narrations, and the astounding Liebst du um Schonheit by Gustav Mahler that preceded the intermission. Here, the task was not only to give voice to the deeply felt text (“If you love for beauty [its title], Oh, do not love me! . . If you love for love, Oh yes, love me!”), but to manage the extravagant, transcendent reharmonizing of arranger and former Chanticleer director, Joseph Jennings. He doesn’t take lightly the modernization of Mahler, and he, and the chorus, succeeded brilliantly. There is Sweet Music by Edward Elgar (Opus 53, No. 1) was a splendid contrast to those who see the English composer through a lens refracted by his Pomp and Circumstance and Enigma Variations. This was harmonically more daring and contrapuntally fine-grained, with interstitial canons, and gave musical substance to text like “of shadowy granite,” “cool mosses deep,” and “from the craggy ledge the poppy hangs in sleep.” No small challenge, you’ll agree. Elgar’s way of doing so was to interpose and overlay diatonic chords, as Paul Hindemith did so resoundingly in his Symphonic Metamorphosis of Themes by Carl Maria von Weber, and more colorfully by Richard Strauss in the Presentation of the Rose scene in Der Rosenkavalier. The final cadence, for example, simultaneously presented C minor over G major, and A flat major over G major, before resolving gorgeously to G.
This was fine, modernistic stuff from the man who said that he came to hate Pomp and Circumstance. Dare I say that no few of us share Elgar’s sentiment, having recently been subjected to its repeated, out-of-tune, jejune, June expostulations while each and every college graduate was serenaded as a baccalaureate by what passed as a wind ensemble on today’s campus? What pleasure and delight to hear yet another breath of fresh air from Chanticleer! And rumples her great cape. He makes a sequin shine. Brings Columbine to the roguish knave. Gleaming like a solar spectrum. The “silhouette” phrase was graced with a musical metaphor of crossing melodic lines, and the “Gleaming” in the ending was voiced with sublime, ethereal, delicious sparseness. The eloquent alto, Adam Ward, surveyed the words beyond the letters with relish, aplomb, and exquisite countertenor. Flows from the Moon in green ways. Ruff’s performance of the spiritual, There is a Balm in Gilead, just made one weep in its beauty, and a sense that its feeling descended not only from personal experience, but a knowing comprehension of generations of African-American struggle, aspiration for freedom, and sense of triumph in Gospel and musical performance. Words cannot quite capture the beauty of his melismas and the subtlety of his profound expression. Fortunately, there’s a video of his performance of this beloved hymn with Chanticleer, taken earlier this year (See below). 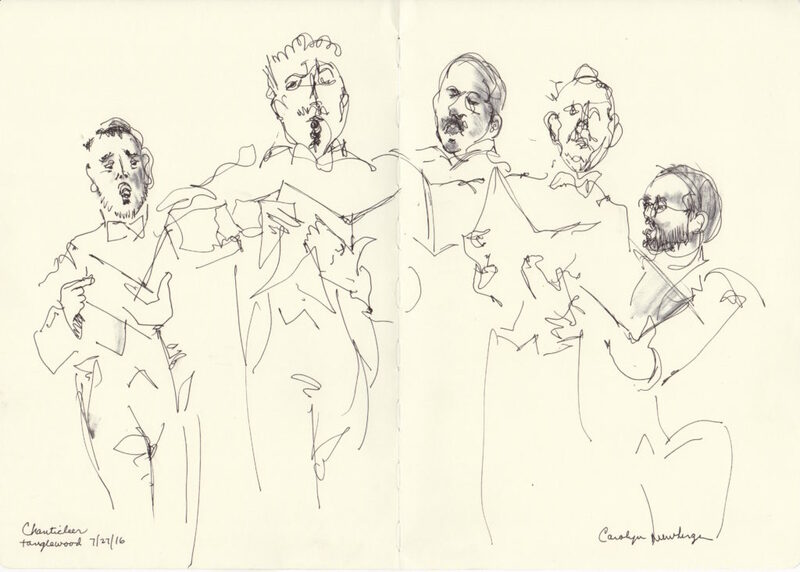 To say the least, the Ozawa Hall audience, justly enthralled, did not want to let Chanticleer go. They responded to the ovation with a gem, L’Amour de Moy, sung in traditional French. Here it is, recorded in 2014 at the Marinsky Theater in St. Petersburg. It was a perfect, reflective conclusion to a sublime evening of song. What a great review of Chanticleer from the Newberger team. Your commentary, lively illustrations and video clips made me feel that I was with you at this wonderful concert. I’m sorry I missed it. Thanks for sharing your talents with us. I don’t understand the concept of reviewing anything that won’t be done again ! It’s not a play or a movie. You can’t read this sort of review and say to yourself…….what a nice review, I think I’ll ………….wait I CAN’T go see this, it won’t happen again !